Live Mealworms, Wood, Cardboard, Ink, Pen. 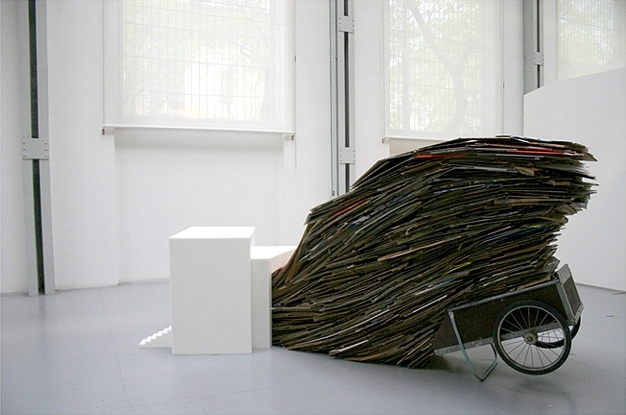 MONICA MARTINEZ is a sculptor, industrial designer and educator who is interested in social change. Her fascination with both permanent and mobile food production and distribution structures like grain silos and urban food carts has morphed into a hybrid art/culinary practice. 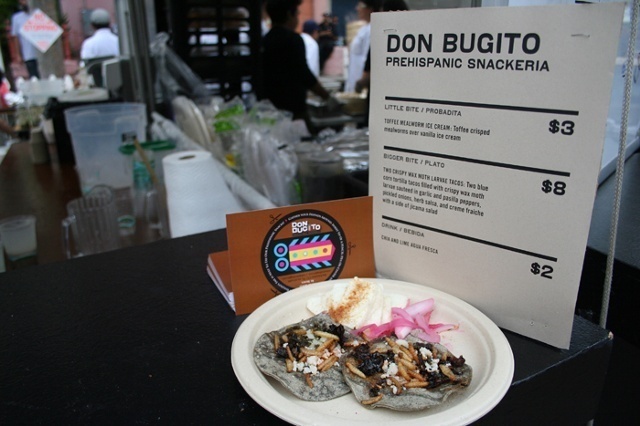 At the 2011 San Francisco Street Food Festival,Monica launched Don Bugito: Prehispanic Snackeria, the nation's first food cart serving edible insects. Monica lives in San Francisco, California. 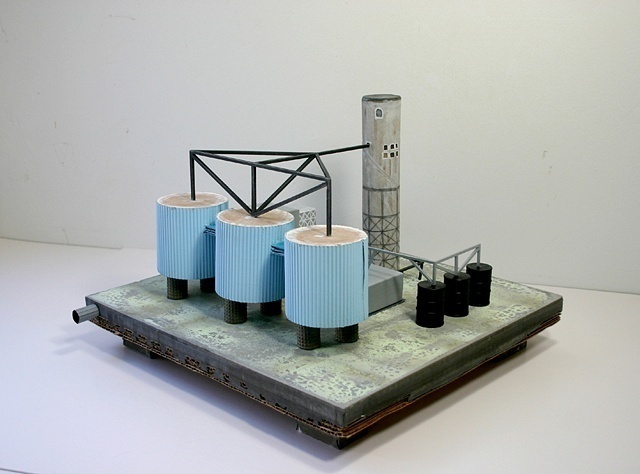 OtherPeoplesPixels: You have been referencing food production and distribution structures for years in your sculpture and photographs. 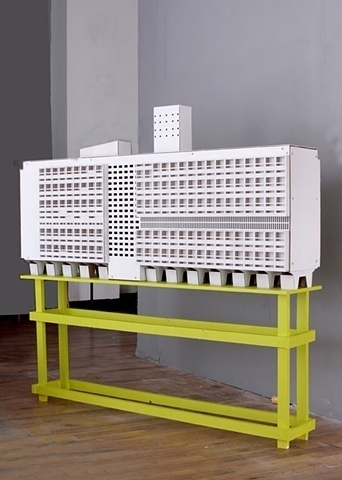 Some examples include The Failure of A Warehouse (2009), Precarious Landscape (2008), and Micro Entrepreneurs (2007), a series of food cart photographs. Where does this interest come from? Monica Martinez: As a kid growing up in Mexico City, I was exposed to the rich visual aesthetics that you find in a city ruled by informal economies. I’m referring to the improvised means of temporary or permanent street food stands, crowed street food markets and those precarious physical structures created out of necessity and urgency around the city. This early exposure has always been reflected in my artistic work. Once I formalized my studio practice, I discovered that what I am attracted to and interested in are the dynamics that make cities function. In the case of the work you mentioned, I was thinking about the flow of food through the structure of a city and about the material response needed to sustain and feed a large population while simultaneously generating capital. My interest also grew as I researched industrial architectures such as silos, granaries, warehouses and food markets as well as any other artifact involved in the transportation and storage of food such as wooden pallets, crates and sacks. I am fascinated by the phenomena of “food storage.” These structures house the food that meets the demands of large populations in urban centers. They also control and regulate the economic aspect of urban food surpluses. OPP: Can you expand on that? How do the structures regulate the surpluses? MM: Granaries and silos were originally built with the intent of sheltering the food and seeds from rodents and harsh years to come, but eventually someone figured out that holding the material and releasing it in a controlled manner—or not releasing it at all—could produce more wealth. This led to the discovery of controls in food as a market. Today, especially in large urban centers, the food surpluses transit through many warehouses and storage spaces before arriving at supermarkets and then, eventually, our tables. These storage spaces may be doing more than simply holding the product to create more capital. They might be actively preparing the food for the market. One example is Cavendish bananas, the most consumed bananas in the world. Most distributors receive them when they are completely green. There is a special temperature-controlled room in their warehouses that allows the bananas to mature to specific commercial standards so they can enter the market at the right time. These buildings mean a lot to me; I see them as icons of power. OPP: Wurm-Haus Unite d'Habitation (2010), Wurm-Haus Headquarters (2010) and Wurm-Haus Unit - Home Micro Farm (2010) are all simultaneously sculptures and actual farms for Mealworms, a high protein and low cost food source. Could you talk about the intersection of architecture and sculpture with social and environmental concerns in the various incarnations of Wurm-Haus? MM: I like to think that there is not much difference between architecture and sculpture. Both address form, space, materials and their interrelationships. When I began working on the first version of WurmHaus, I was looking at the global panorama of modern mechanization and industrialization of food production—basically factory farms, massive agricultural crops and other macroscale operations. But in my studio, I was working on a microscale. I started questioning the relationship that exists between the architectural spaces of the food that we produce and consume and the spaces we inhabit. I found a lack of connection between these two types of spaces. Nowadays, there is an urgency to add an environmental focus to our food production and our urban living conditions. 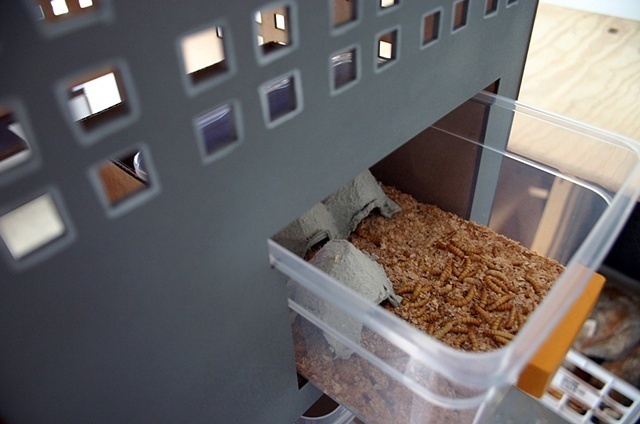 I began reading about the mechanics of insect architecture and the relationship of insects to their spaces and food storage. I discovered that architects like Le Corbusier and Gaudi were influenced by the world of insect architecture. These architects intended to implement better living quarters for humans, but sadly they disregarded the importance of improving our production and consumption of food from an architectural point of view. OPP: What led to the shift from sculpture that documents and references movable structures of food production and distribution to your active participation in those things via Don Bugito, your street food project? 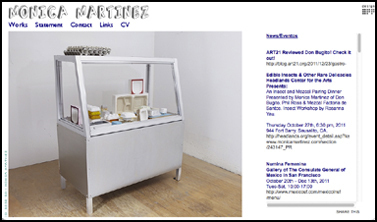 MM: In 2010 I showed the WurmHaus works at Eyelevel Gallery in Brooklyn, and we offered a fancy edible insects dinner to a crowd of 40 people. This dinner was such a success: people responded much more strongly to the edible insects than to the static sculptural works sitting in the gallery. I decided to expand WurmHaus into a food project that eventually became a food business. I conceived of Don Bugito as a social sculpture project. I wanted to reach a wider audience, but it is a big challenge to introduce edible insects into the North American food market. I had to apply for permits from the city and the health department in order to operate. Ironically I have become a street food vendor and am now inside the world that has always inspired me. OPP: Don Bugito has garnered a lot of attention both in both art and foodie circles. What are the challenges of a project that is a hybrid art/culinary endeavor? MM: So far this project has been a huge challenge, but it's given me the opportunity to connect with hundreds of people. Once these foods are completely introduced into the American food market, I hope to eventually create social change. In general I have found more support in the culinary world than in the art world, but the former has a hard time recognizing me as a chef. Professionally speaking, I am not a chef. I approach food as one more material in my creative palete; it has to be cut, heated and transformed, just like metal, wood or plaster. My first day in an industrial kitchen, I got a steam burn on my right hand. This made me think that kitchens are just another version of shops. There are things that can hurt you, and you have to be on top of things to prevent injury. But the art world is also confused about what it is that I’m trying to do. It's unclear how to integrate my work into an exhibit or art dialogue. I hope this will eventually change. OPP: It definitely seems to be an issue of framing. There are precedents in the art world such as Rirkrit Tiravanija’s dinners. And you mentioned the term "social sculpture," which was coined by Joseph Beuys in the 1960s. Are you influenced by these artists? Do you consider what you do to be part of the art as social practice or relational aesthetics models? MM: Joseph Beuys has certainly influenced my creative thinking. So has Gordon Matta Clark’s Food project. My recent work relates more to the ideas that Beuys proposed as social sculpture than the Art as a Social Practice or Relational Aesthetics models. When I began working on the idea to introduce edible insects into the American food market, I encountered many obstacles that required a lot of thinking and planning. I had to build conceptual and physical structures to support this idea. WurmHaus was the first step that led to Don Bugito. I found that through food and cooking, I could introduce ideas into a cultural realm as a commercial enterprise. It is a physical operation that introduces an alien material through a social operation. In 2010 I joined La Cocina (a nonprofit food incubator here in San Francisco) for support and guidance in this endeavor, and I would say that this project has become an open ended social object. OPP: How has running a food business impacted your studio practice? Has it changed the way you think of your role as an artist? MM: I am struggling a little bit right now in trying to understand how my work fits into the commercial art world that I was part of before I started this project. I have spent the past two years completely immersed in Don Bugito, and I am not sure yet how my studio practice will evolve as a result of this. OPP: Is there anything you miss about being an artist making sculptures in the studio for exhibition in a gallery? MM: It is hard to answer this question as I never considered myself a dedicated studio artist. Most of the time, the ideas for my work come directly from objects that surround me out in the world rather than discoveries in the studio. I usually spend more intense time in the studio right before a show instead of as an everyday or regular practice. What I miss the most is being able to fabricate whatever object I have to build. I enjoy engineering and solving fabrication problems. I think I prefer being in the studio more than a kitchen, where I still feel that there are a lot of intimidating rules and techniques that have to be learned. Food is certainly a medium where the public can be more critical than in contemporary art. I think we artists have an invisible shield that protects us. We can make whatever we want, but there is not much space in the culinary world for something that looks as disturbing as a Wax Moth Larvae Taco or a Toasted Crickets Tostada. To learn more about Monica's work, please visit monicamartinez.com.